Eid will be on Wednesday, August 22, inshAllah. Eid prayer will be held at Masjid Hamza at 9:00 am. The Parkdale Islamic Education Centre (PIEC) was completely established for nonprofit purposes. By the end of July 2017 we have paid off $15000 qard hasana, now the masjid is debt free, Alhamdulillah! to complete the phase 2. We ask Allah for help, and we also reach out to you, our generous donor, to help us in these pivotal few months. Please remember the promise of the Prophet (may Allah send His peace and blessings upon him completely), that Sadaqah does not decrease a believer’s wealth at all. In fact, Sadaqah is simply a transfer of funds from your Dunya account to your Akhirah account. Please consider making the most profitable investment of your life and help build the House of Allah. InshAllah through Sadaqah, Allah will increase your wealth, put Barakah in your dealings, repel calamities in your life, raise your ranks, and write you among the generous. InshAllah He will also give you reward for every good deed committed in our new masjid. The management of Masjid Hamza has always treated donations and loans to the masjid as a very serious trust. Every penny is accounted for. Every penny goes towards the masjid. And every transaction is publicly available for review. We understand the trust of your wealth. And we promise you honesty, integrity and transparency. This is an opportunity to make a difference for Muslims. Giving Muslims a permanent place to pray is one of the noblest deeds. Please donate generously. 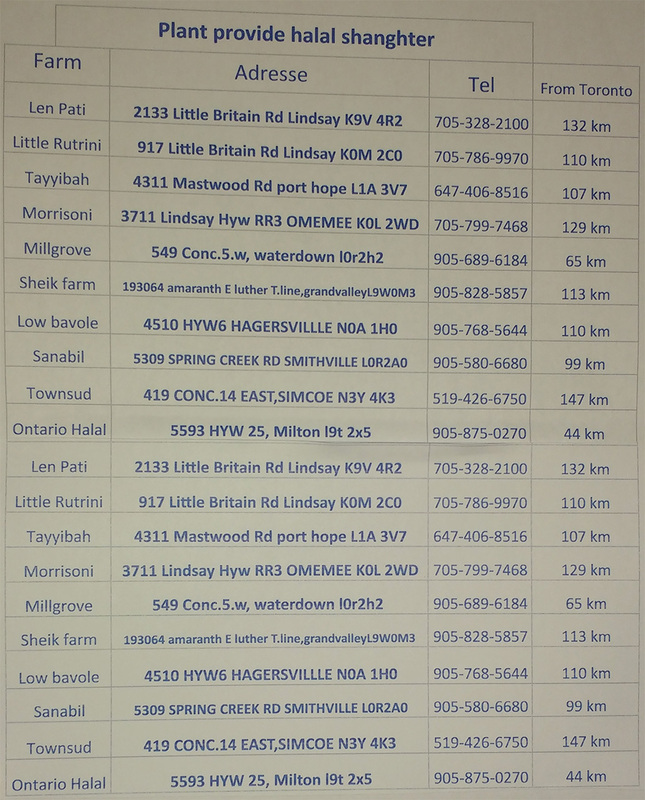 You can mail a cheque payable to “Parkdale Islamic Education Centre”. OR mail a void cheque with installment details for direct withdrawal. OR mail your credit card information with installment details. 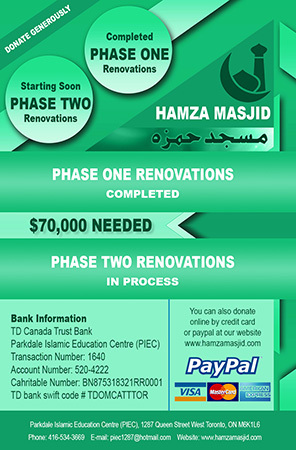 OR visit our website at www.hamzamasjid.com to donate via PayPal. OR visit us in person at 1287 Queen St. W.
Insha’ Allah, future plans include facilities for funeral services and a full time school for Muslim children which will incorporate the Ontario ministry of education curriculum along with Islamic studies. You can find out about our study circles, tutoring services and attend programs being conducted by Imam Ayoub. Please check out our events section to get the schedule information about the upcoming events in the Parkdale Islamic Education Centre (PIEC). Feel free to share it on facebook and tweet about it online. The Parkdale Islamic Education Centre (PIEC) has become a focal point for the Muslims of Toronto. It is centrally located in the heart of a Muslim community and services the religious, social and recreational needs of this community. 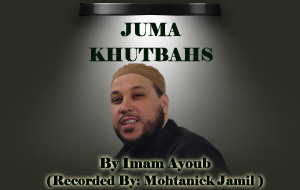 In addition to the five daily prayers, Juma services are conducted each Friday to a full house of worshippers. The Masjid conducts classes in Islamic education for young children, and hosts spiritually enlightening events. Guidance & counselling (Can book a meeting through the phone or email). The Life of 'Umar ibn al-Khattab R.A. Please donate generously to help us save the Masjid & complete the project. Jazak'Allahu Khayrun. 8 Months Duration. End of September to May 31. It is the parents responsibility to drop off and pickup their kids in the basement of the Hamza Masjid. Donot drop your kids on the main enterance for safety purpose. 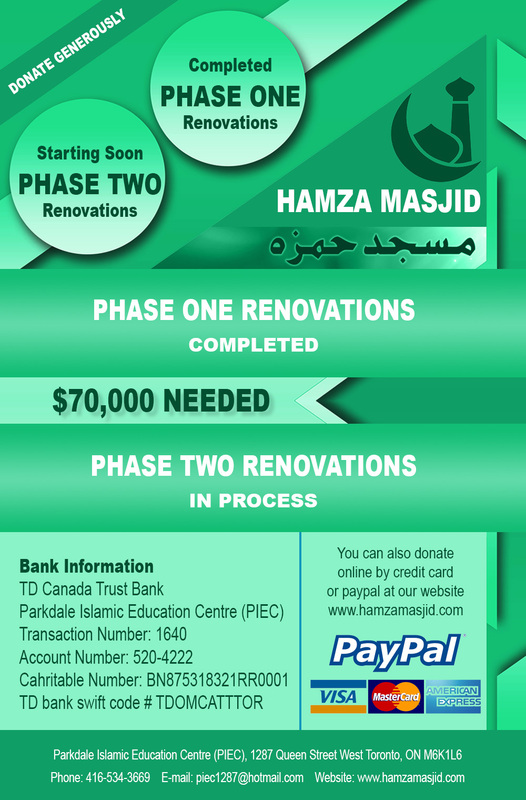 Congratulations, Hamza Masjid has been bought on July 31, 2015 with all your help and support. Alhamdulillah Masjid is now debt free. We are starting Phase 2 renovations. Please Help us to collect funds of $100,000 for Phase 2 renovations.